In previous posts I’ve mentioned my attempts to learn some of the Welsh language now that we live in North Wales. I don’t have the language skills to ever hope to get to conversational level, but I’m getting a reasonable vocabulary of place names. 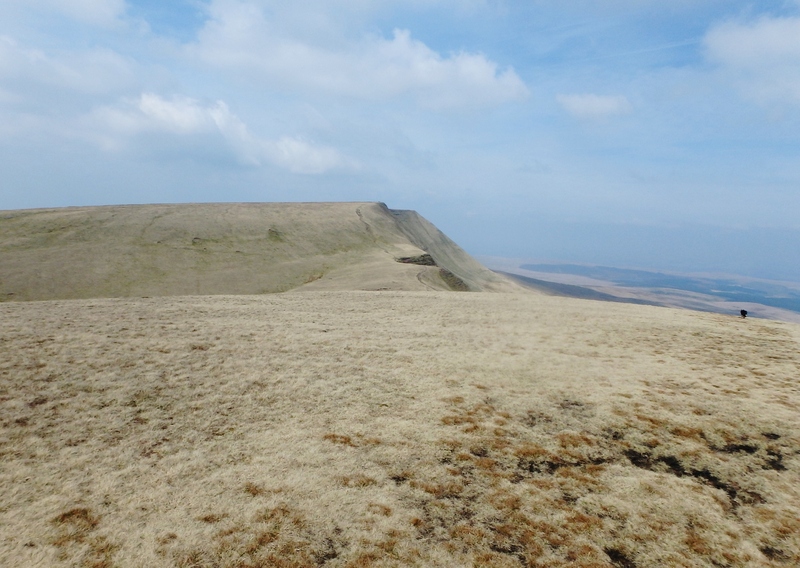 Mynydd Du in the Western Brecon Beacons is a pretty easy, it means ‘Black Mountain’, but in the Eastern Beacons we have Y Mynyddoedd Duon, which means ‘The Black Mountains’. Lots of potential for confusion there then! 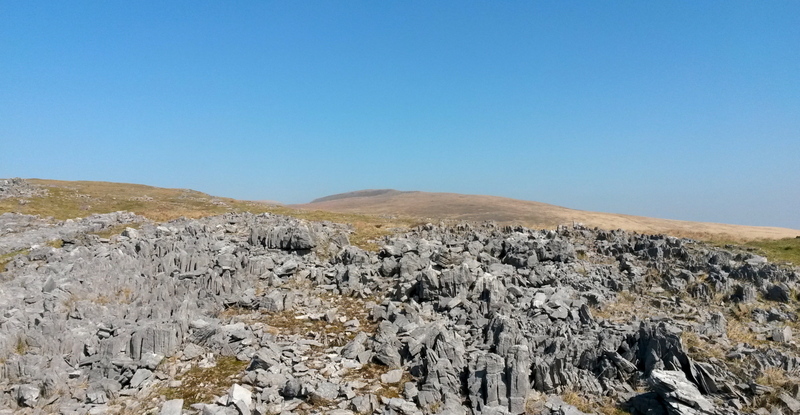 The ridge of Fan Hir heads north from Dan yr Ogof on the A4067 road, heading right into the heart of the wilderness area of Mynydd Du, but from the west you might wonder why this is named Black Mountain as the rock here is white limestone. 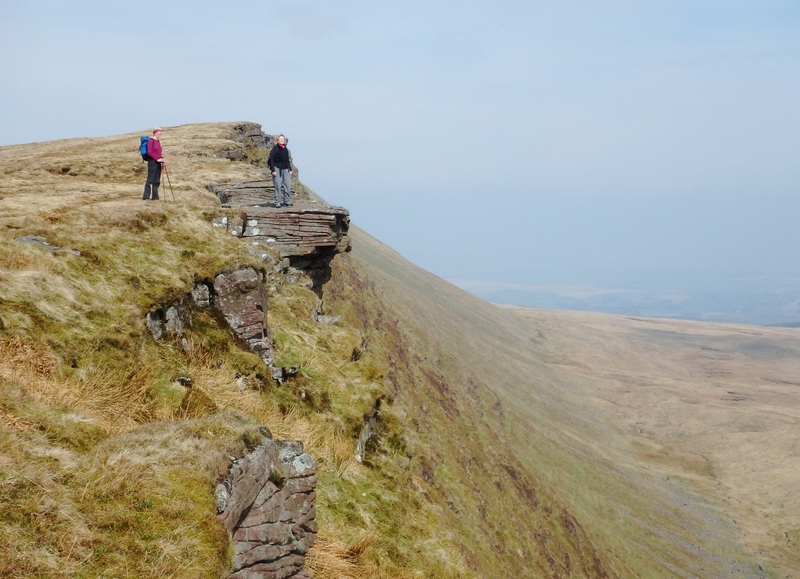 Look at the eastern side of Fan Hir though, and it starts to make sense – a long escarpment of sandstone makes a dramatic picture for motorists driving south. 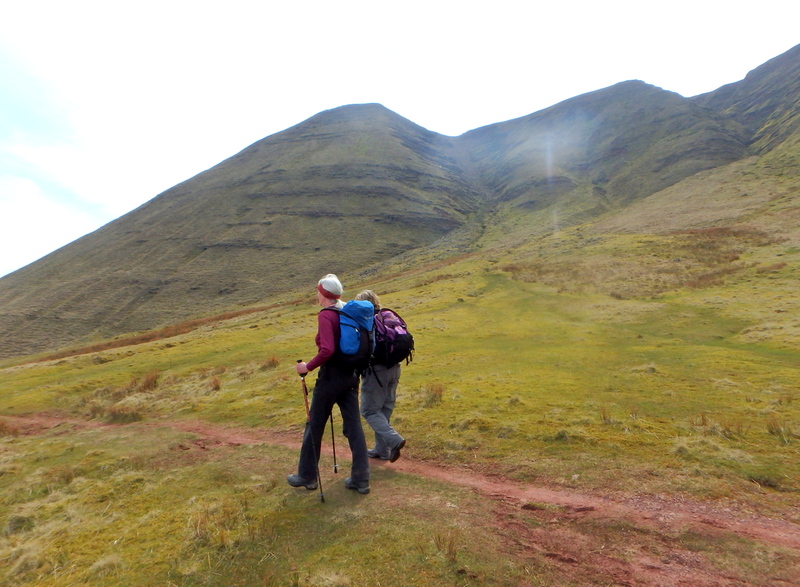 A Beacons walk usually includes our mate Barbara who lives in Mid-Wales. 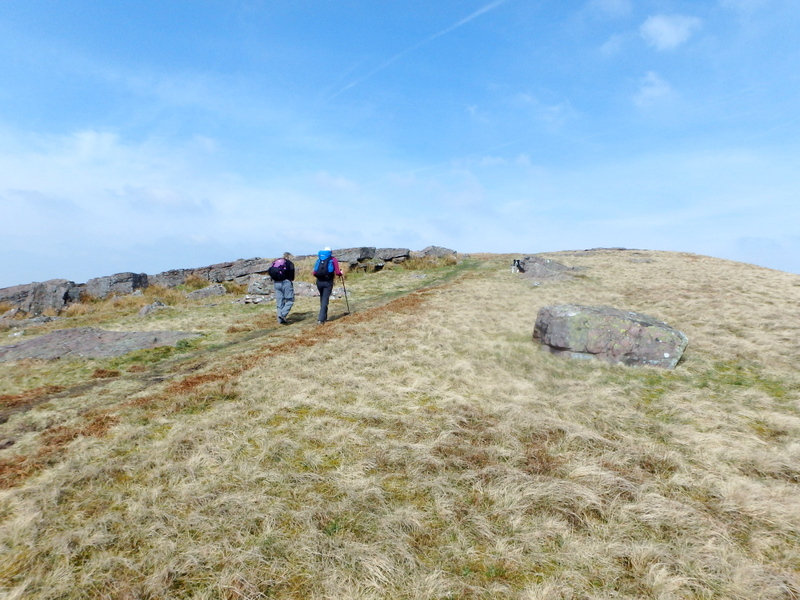 Our last trip out together had been in the previous August (see post #169), and Barbara was keen to get a few more miles in her legs before a trekking trip to Nepal. 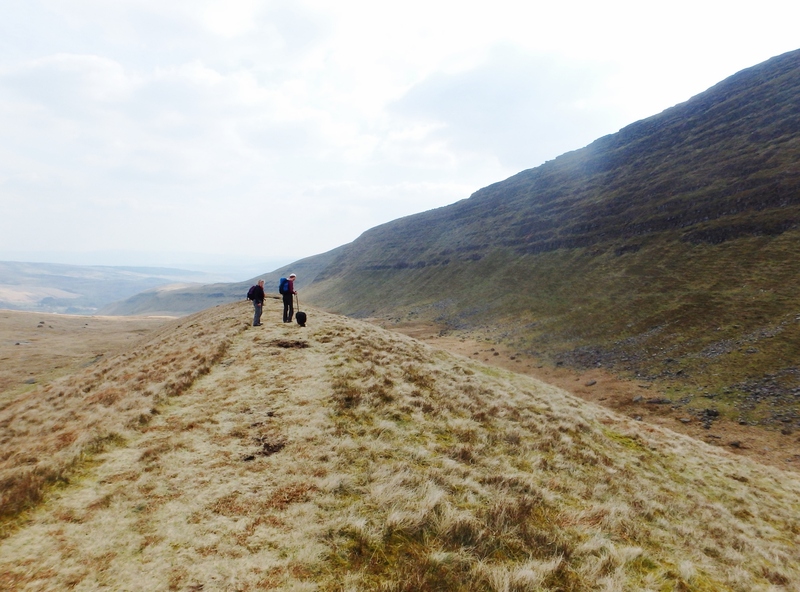 We started near Dan yr Ogof, one of the largest cave systems in the UK, and set out to walk the top of the Fan Hir escarpment. 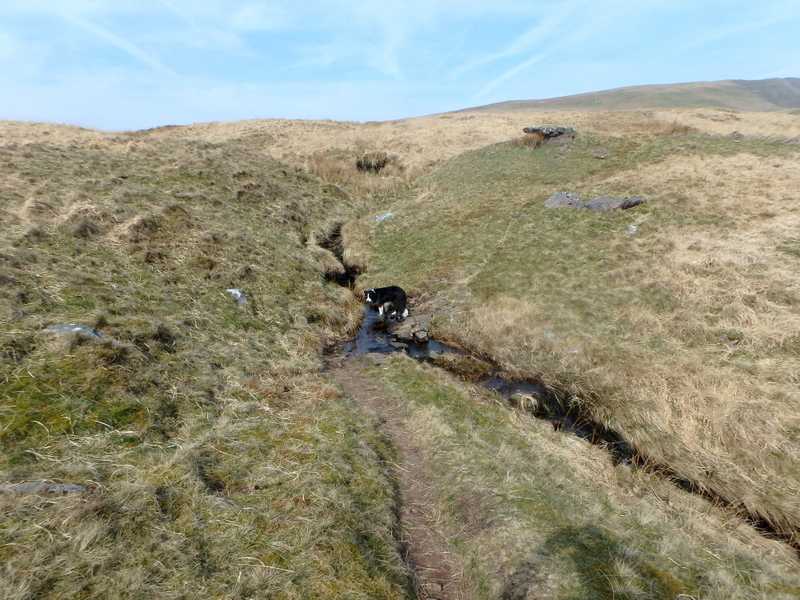 The recent dry weather had left the ground parched, and I wondered how much of my water supply Border Collie ‘Mist’ would need, but a Collie could find a drink on a piece of damp blotting paper, and she soon found a stream. 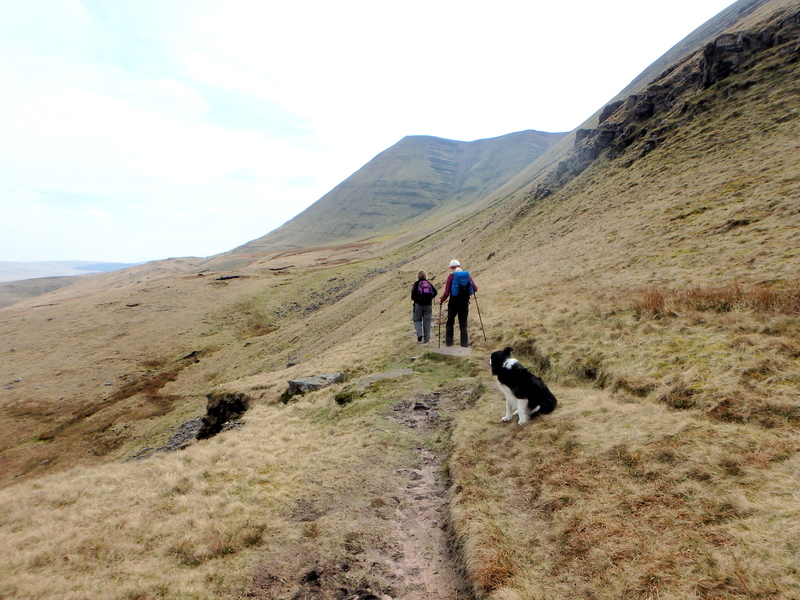 On the edge of the escarpment …. 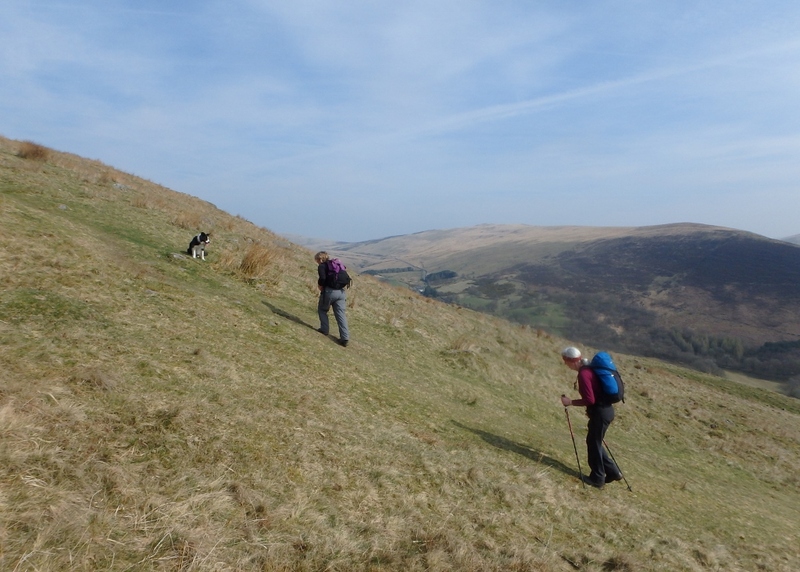 The first part of the ascent was the steepest bit, but before long the angle eased as we reached the top of the escarpment. Barbara was persuaded to pose for a photo on the cliff edge overlooking the long drop down to the Beacons Way Trail below us, before we continued to the summit of Fan Hir, meeting the first of several groups taking part in their expedition for the Duke of Edinburgh’s Award Scheme – I’m glad I don’t usually carry rucksacks that heavy nowadays! 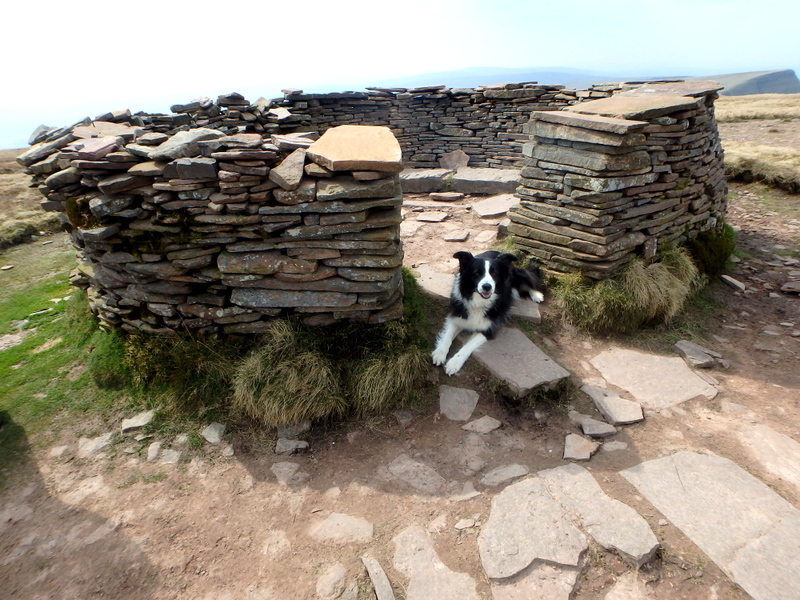 Summit shelter – couldn’t get in, it was full of dogs! 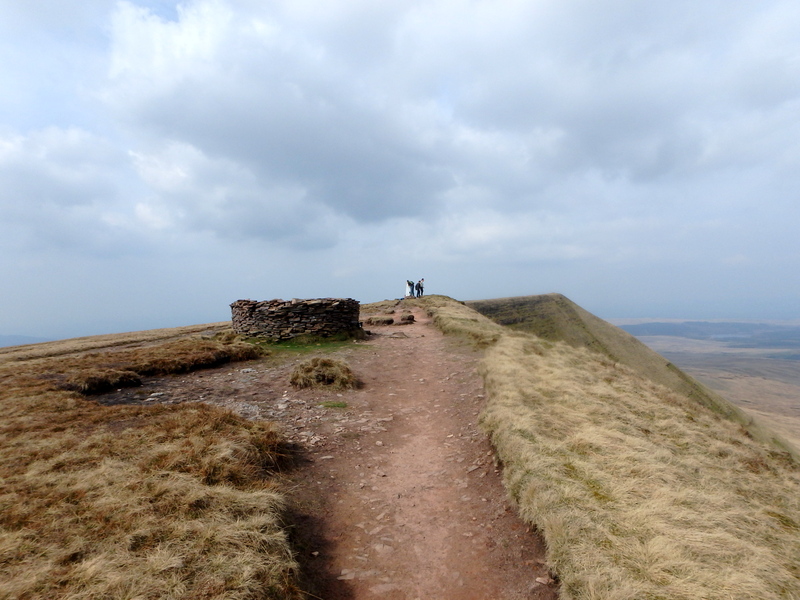 Fan Hir (it means ‘Long Beacon’ or ‘Long Summit’) was followed by Fan Brycheiniog (the ‘Brecon Beacon’ or ‘Brecon Summit’) which was the highest point on the walk at 802 metres altitude (2631 ft). 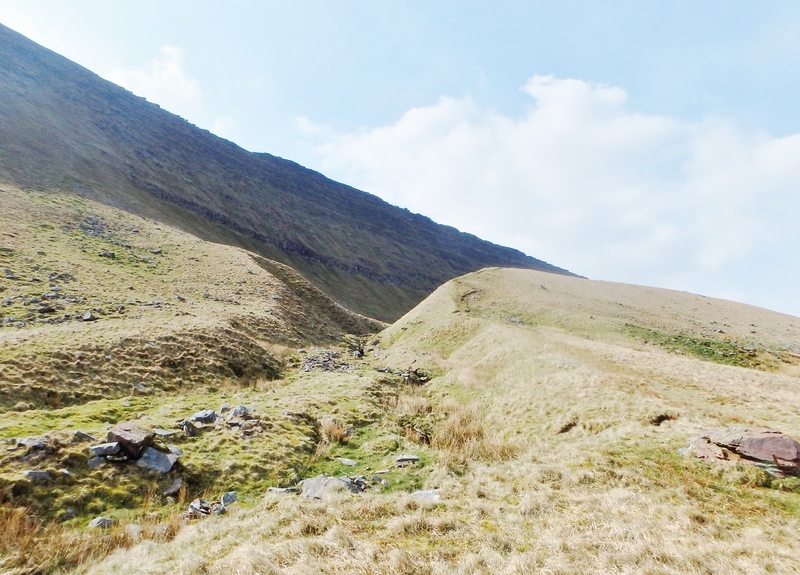 As with many things in life, size isn’t everything, and this compact range of hills has a big, wild feel about it. 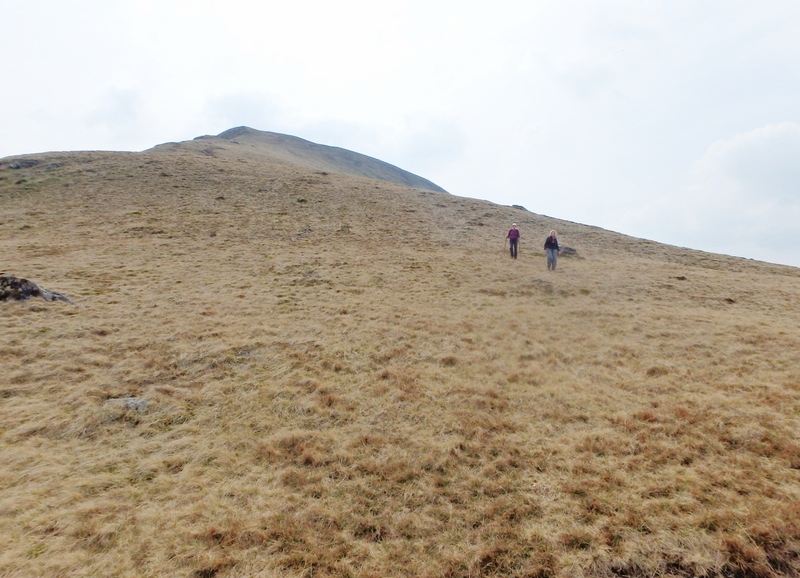 ‘Mist’ was first to reach the summit shelter (nothing new there then) and we continued on to Fan Foel (‘Bare summit’) with views back to the lake of Llyn Fan Fawr (‘Big Beacon Lake’). 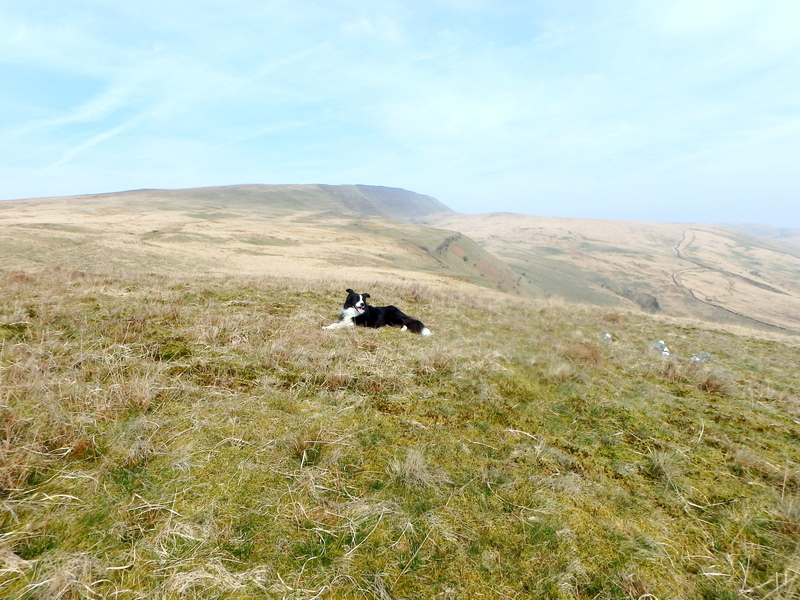 Then it was time for a bit of downhill. 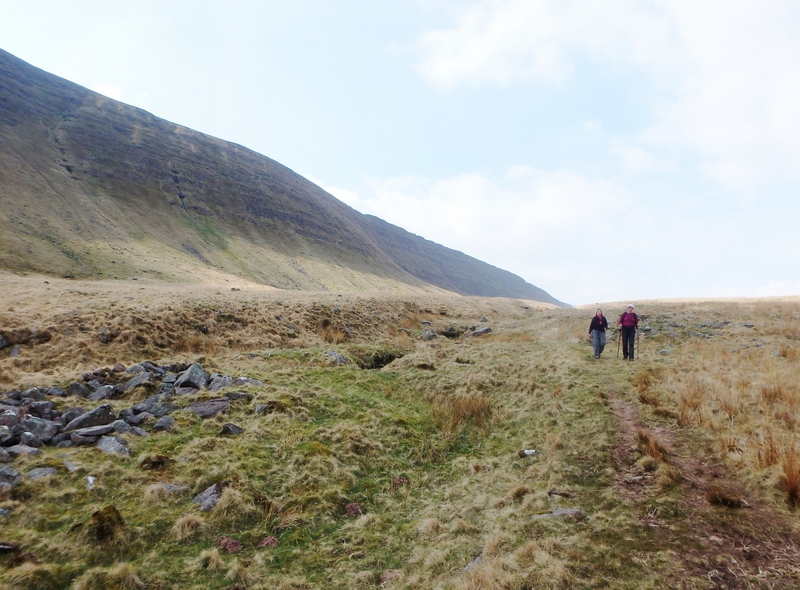 Heading back towards Llyn y Fan Fawr …. 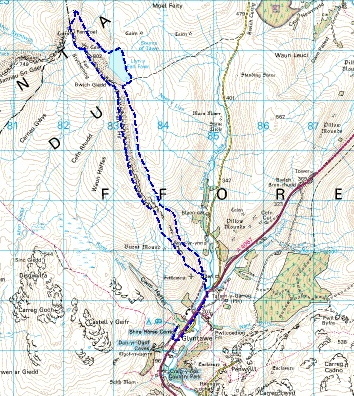 Our route back was almost a reverse of the outward route, taking us beneath the escarpment this time. 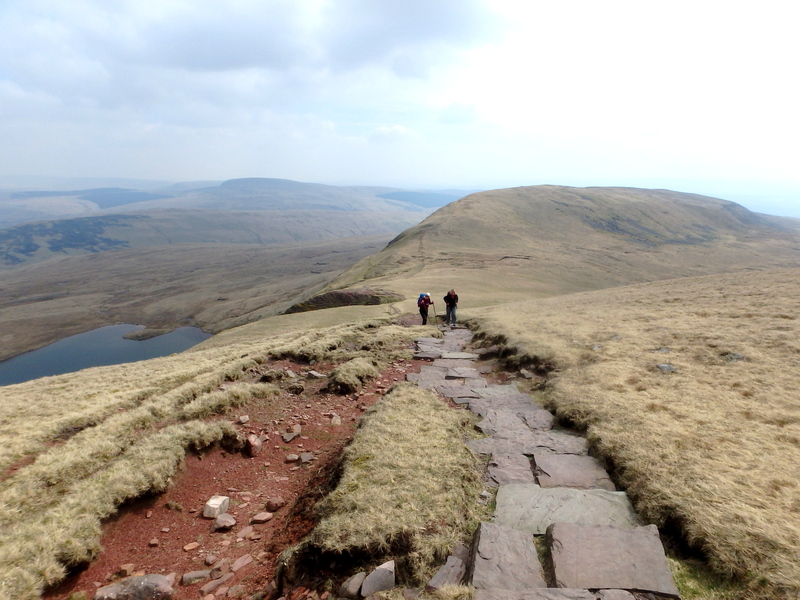 We passed Llyn y Fan Fawr on the way before joining the Beacons Way Trail. 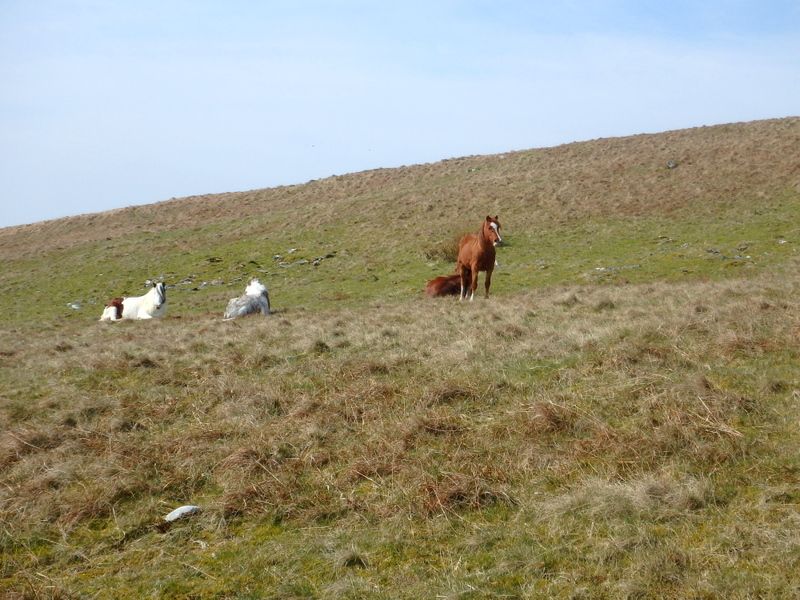 We hadn’t rushed, but the trip had taken about seven hours, good trekking practice for Barbara. 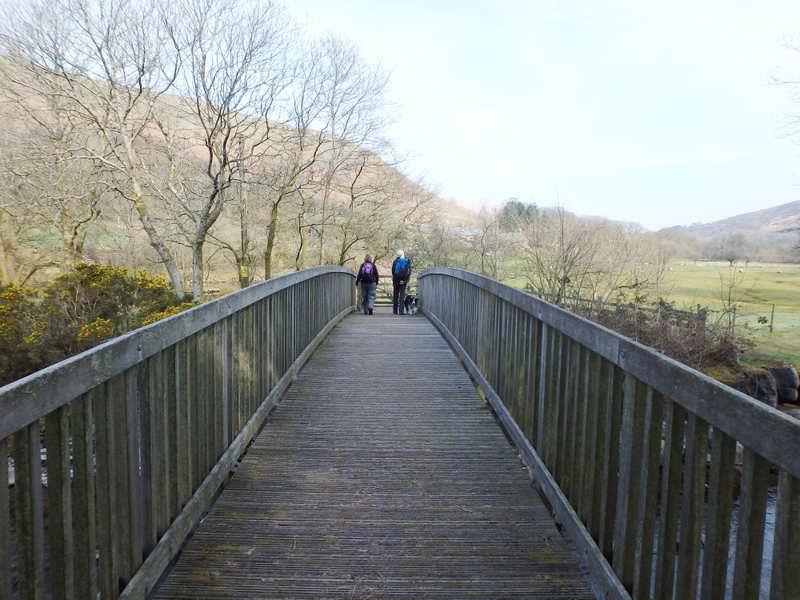 Regular readers of the blog will be amazed to hear that I got the timing right on this walk, and the Gwyn Arms was open! 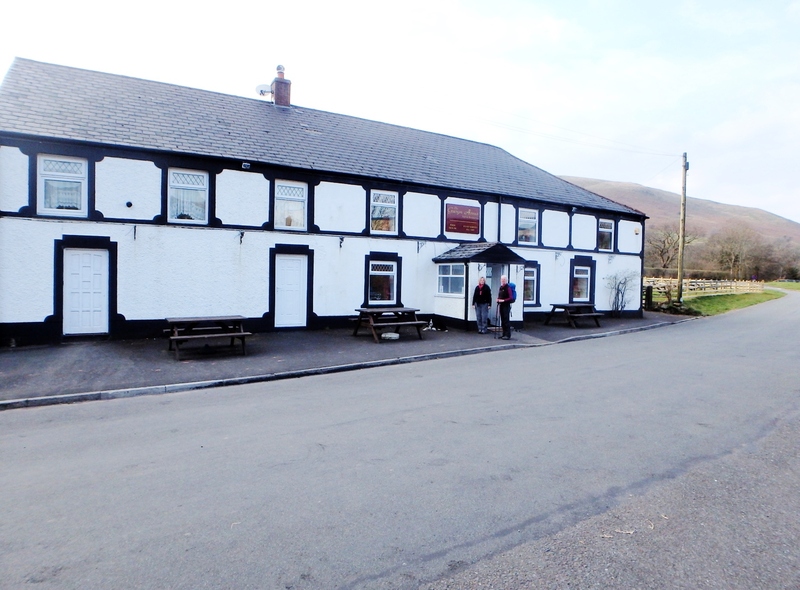 The Gwyn Arms – Got the timing right this time! That looks a really nice walk. 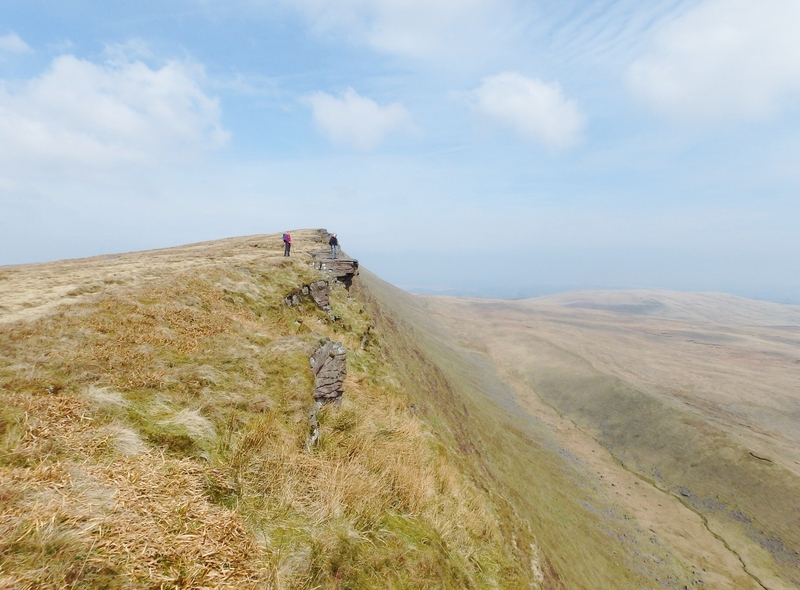 I have to disagree with the Dales thing though as I think Wales is much, much nicer – greener, more leafy in the valleys, more interesting hills (excepting the 3 peaks of course). Are you still having a dry spell? We had a short one but we’re well and truly breaking it now! I’m the same as you with the Welsh – I’d have loved to have learnt it properly but I was interrupted by having to do French (which is too similar) at school and so never managed to get to conversational level but know a lot of nouns. 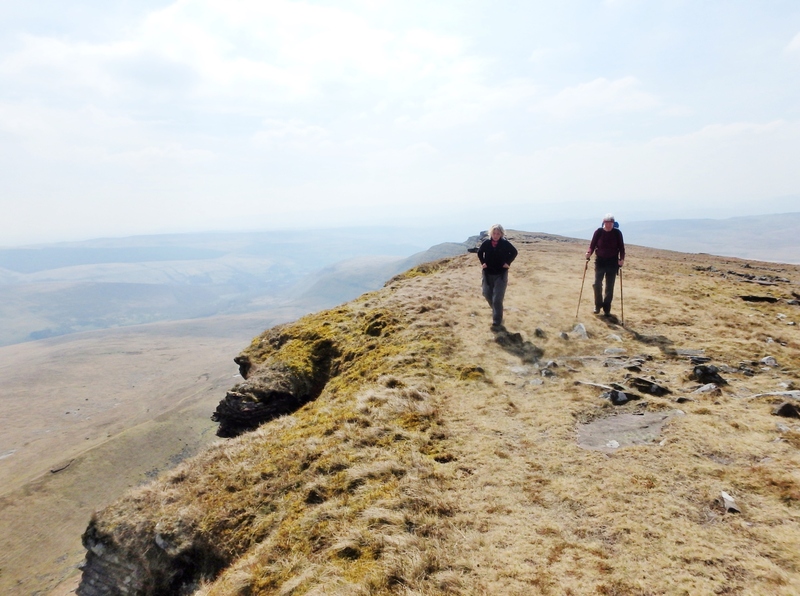 Cheers Carol – the dry spell has been well and truly broken in Wales – it was snowing on the summits over the early May Bank holiday! yeah, when I went up to NW Cumbria last weekend, there was plenty of new snow on Skiddaw! 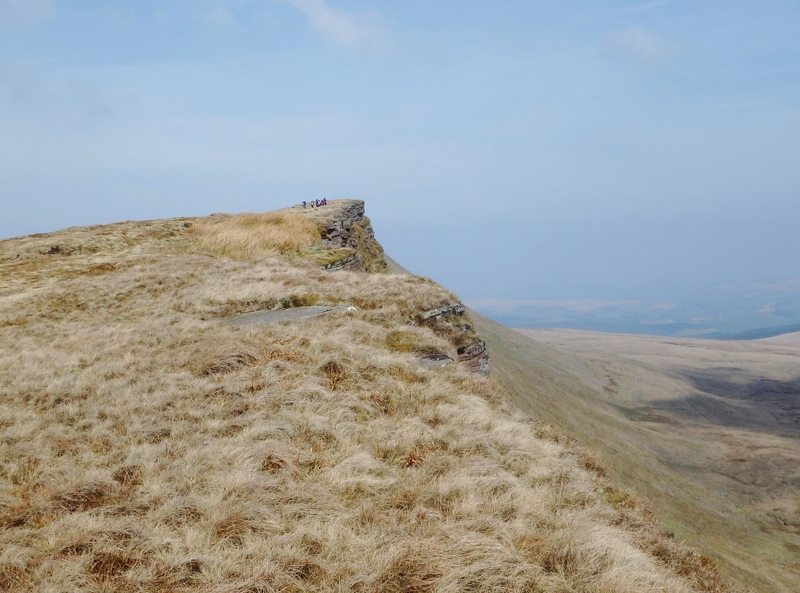 Cheers SP – that escarpment on Fan Hir is fairly unforgettable!